The distinguishing feature of Islam is practicality. Prophet Muhammad(pbuh) set an exemplary benchmark for us; his life a living reflection of the Qu’ran. 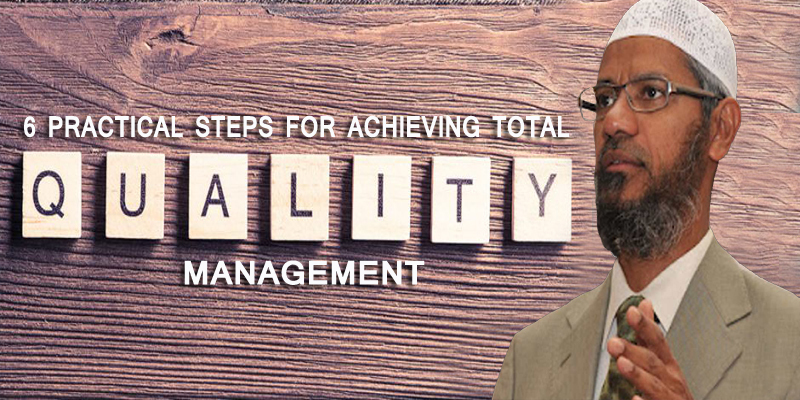 To be Productive Muslims, let us look at how we can incorporate Total Quality Management in our daily activities. Intentions draw a fine line between faith and hypocrisy, and because they are only completely and truly known to Allah, they are our true test of faith. The question is how to have sincere quality intentions, meant only to please Allah and attain His most prized blessings. Be sincere and honest with yourself. Only then will you be honest with Allah. Read about the passion of the companions of the Prophet(pbuh) for prayers and try to emulate them. Understand that your prayers are a gift to you from Allah through Muhammad(pbuh): Show Allah how much you love His gift! Prophet Muhammad(pbuh) said: You will not enter paradise until you believe, and you will not believe until you love one another: spread salaam (the greeting of peace) among you” [Tirmidhi]. The four dearest words to Allah: Initiate all your plans and works with the name of Allah, and end them by praising Allah[ swt]; optimism, contentment and barakah are sure to find you. Speak no evil: If you are in a habit of swearing or using bad words, tell a friend or a family member to keep a check on you and find good company to benchmark against. Increase your frequency of remembrance of Allah, and you will naturally find your tongue and your heart shying away from words with any degree of vulgarity/obscenity. Prophet Muhammad(pbuh) said, ” A true believer is not involved in taunting, or frequently cursing (others) or in indecency or abusing” [Tirmidhi]. Silence is golden: The Messenger of Allah(pbuh) said: “Whoever believes in Allah and the Last Day, let him say what is righteous or keep silent” [Bukhari]. Share your knowledge: Prophet Muhammad(pbuh) said: “Acquire knowledge and impart it to the people.” [Muslim]. And believe it or not, sharing knowledge with friends does leave behind a stronger impression on your own memory. We all have our own way of loving one another but the best way to love is the way of our beloved Prophet Muhammad(pbuh). Love Allah and His Messenger the MOST! Don’t just say you love them, live your love: follow the Qur’an and the Sunnah. Love the Qur’an: Recite it with love, and memorize it with love and share it with love. Love the Sunnah: When you speak of Prophet Muhammad(pbuh), speak of him with love and remember to send blessings on him as much as you can and strive to emulate him with love, compassion and gratitude. Be grateful to one another as gratitude leads to love. Only by being grateful to people can one be grateful to Allah. Share the knowledge and the blessings Allah has granted you, with the Muslim Ummah. Facilitate for one another the path towards jannah. Enjoin what is good, forbid what is wrong, and believe in Allah the way the companions of the Messenger of Allah(pbuh) did. Finally, live to please The Creator and His Creation purely for the sake of Allah. Be Productive Muslims – the Muslim Ummah is meant to excel.